The world of hard corals is equally vibrant as is that of soft corals. Also, hard corals are relatively easy to maintain than soft corals. If you are a beginner or even a serious and experienced hobbyist, hard corals for your reef aquarium can be a good choice. Blue Mushrooms are one such variety of hard corals of the Genus Actinodiscus that require low maintenance and add display value to your marine aquarium as well. Other names: Blue Mushrooms belong to the Family Actinodiscidae or Discosomatidae and are also commonly called as Mushroom Anemones, Flower Corals and Disc Anemones. The scientific name of Blue Mushrooms is Actinodiscus species. Coral Type: Blue Mushrooms are hard corals of Polyp type. Origin or natural range: Blue Mushrooms originate in the Indian Ocean and Pacific Ocean in the South-East Asian country, Indonesia. Size: Small sized Blue Mushrooms are 2 inches to 3 inches long, medium sized Blue Mushrooms are 3 inches to 5 inches long while, the large one are 5 inches to 7 inches long. The sizes of Blue Mushrooms may however, vary being contingent upon many factors such as the depth of the water they are living in, the surrounding environment of the Actinodiscus species and the flow of the water in the vicinity of Blue Mushrooms. Color: Blue Mushrooms come in a varying range of blue color such as, blue, metallic blue, blue-green and violet. Blue Mushrooms can have a pinkish or purplish tinge in them. The depth of blue color of the Actinodiscus species is determined by the degree of illumination they existed in and the degree of illumination they get in your marine aquarium. If your marine aquarium has ample illumination then the Blue Mushrooms stay near to the rocks and acquire deeper blue color. Also, the blue color of the Actinodiscus species may have pattern or striped coloring instead of a uniform color. Morphology: Blue Mushrooms are relatively hardy as compared to other marine invertebrates of the Phylum Cnidaria. Compatibility: Blue Mushrooms are relatively moderately aggressive as compared to the other marine invertebrates. 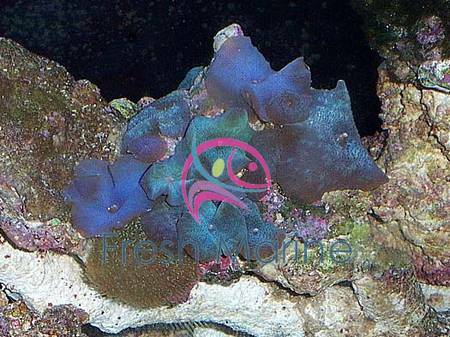 Breeding: Blue Mushrooms breed quite easily and speedily in your marine aquarium. Blue Mushrooms divide in order to propagate and each fragment can develop into a new Blue Mushroom. Growth environment in your marine aquarium: The following factors should be maintained as specified for healthy Blue Mushrooms. Temperature: Blue Mushrooms are comfortable if your marine aquarium�s water temperature is 72 to 78 degrees Fahrenheit. Specific gravity: Blue Mushrooms require a specific gravity of 1.023 to 1.025 in the marine aquarium water. pH: Your reef aquarium water should have a pH of 8.10 to 8.40 for the benefit of Blue Mushrooms. Illumination: Low illumination is fine for Blue Mushrooms. In case the light intensity in your marine aquarium is high, keep the Blue Mushrooms at the bottom of the tank. Water flow in the aquarium: Low water flow is ideal for Blue Mushrooms. Marine aquarium habit & habitat: Blue Mushrooms are not lethally poisonous in nature. You can place the Actinodiscus species anywhere in your reef-type marine aquarium. Provide ample space to the Blue Mushrooms. The Actinodiscus species may take a few days in opening up in your marine aquarium. Feeding: Blue Mushrooms are photosynthetic in nature due to their symbiotic existence with the algae, zooxanthellae. The alga dwells within Blue Mushrooms. They may, however, also feed upon acellular planktons and meaty bits. Add Iodine to your marine aquarium water as a supplementary nutrient for Blue Mushrooms therein. Care: Blue Mushrooms are easy to maintain in a regular reef aquarium.